* Fresh and juicy lime kicks this off… surprise. * For a natural, it projects quite strongly and has a lot of oomph. * Coconut enters the party, and suddenly it’s a bit sweeter, but still projecting. * After about 45 minutes, Lime in the Coconut gets really close to the skin. There is a subtle haze but it quiets down a lot. * The coconut lime mix becomes quite sheer after 2 hours and can only be sensed if you smell you arm. Summary: As I explore more and more fragrances, I realize there are notes with which I have a contentious relationship. For example, vetiver never works on my skin – it goes rancid, tart, caustic, sweaty, and evil (bad) skank. Lime is another note – I love the smell but unfortunately, it never lasts on my skin. Tom Ford Azure Lime is a great scent but I rarely get more than an hour of wear from it. 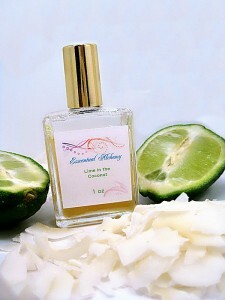 Lime in the Coconut is a FUN, flirty, tart lime softened with sweet coconut (and inspired by the song). To be crass, on my skin, its like that quickie fling I wish would last several hours so that I could enjoy it longer. Longevity is often an issue with natural scents, so I would encourage you to test this (and others from the Escentual Alchemy line) but be prepared to reapply every few hours. Maybe it really is like a good drink, you need one every few hours to stay hydrated (and keep the buzz pleasantly going). Disclaimer: Sample provided by publicist for review. Image courtesy of Esscentual Alchemy. Coconut is a real trick in a natural perfume. It took me a long time to get something I was satisfied with. It involved a toasted coconut tincture, coconut oil, and a couple other things. It’s a delicate balance to get longevity, and also create a composition that tells the story you want it to with naturals. This was such a fun review, thanks so much for taking the time to sniff and share your thoughts. I love this one for summer. It’s so fun. I do find that the coconut “hugs” my skin longer than the other notes but I’m fine with that.